ISO 38500 brings clarity to the topic of IT governance and provides a framework based on six guiding principles for good corporate governance of IT and a model to govern IT with three main tasks: evaluate, direct and control. 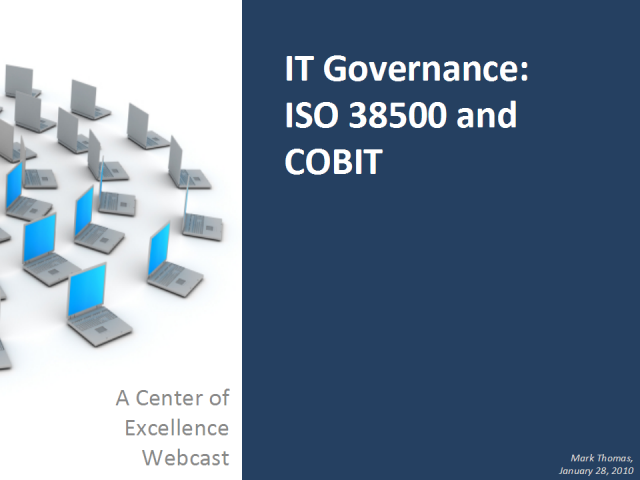 A solid underlying platform to ISO 38500 is CobiT , which is a good reference for the policies, processes, structures and controls needed to implement the management system that supports governance. There are several frameworks to choose from, but which one is the best for you? The more appropriate question would be which ones are the best, and how should you be integrating them. In this short but very informative webinar, join Governance expert Mark Thomas from United Training as we explore the “assembly instructions” for organizations who are exploring combining the ITIL and COBIT frameworks. When implemented properly, these provide a holistic framework of good practices and fill in many holes that exist when only implementing a single framework. How do you handle dealing with an unyielding sponsor who provides sketchy details with an aggressive time line? This presentation will look at one of the most famous stories of all time and draw comparisons to Noah as the early adapter of the Agile methodology. Over 60% of IT Service Management projects fail to meet their objectives and are deemed failures by their sponsor. Join IT Service Management expert Mark Thomas as he presents the courageous undertakings of key ITIL implementation strategies that will assure you a winning IT Service Management program. Monthly Live Webcasts for IT Prof looking to get ITIL certified! This channel is geared toward business professionals looking to achieve certification or knowloedge in ITIL, Cobit, MOF, Project Management, Business Analysis, Agile and many more!